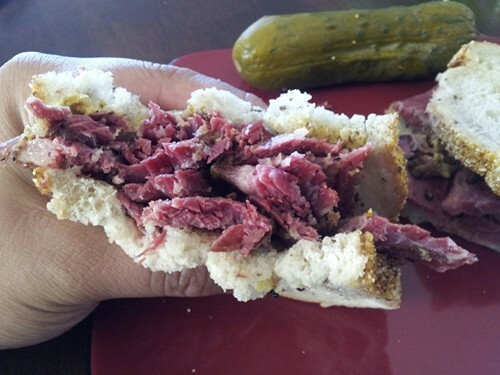 Maybe you consider yourself an expert on pastrami and corned beef, those cured-meat staples of the Jewish delicatessen. But have you tried Montreal-style smoked meat? Now you can, thanks to Augie’s Montreal Smoke Meat, a new pop-up that debuted on Monday at Beauty’s Bagel Shop (3838 Telegraph Ave., Oakland). According to the company’s own description, Augie’s “smoke meat” is beef brisket that’s cured for seven days, then cold-smoked, baked, and seasoned with a pepper-and-coriander rub, resulting in meat with “the spice of pastrami” and the “tender, crumbly texture of corned beef.” At the Beauty’s pop-up, the meat is hand-sliced and served on rye bread from San Francisco’s Wise Sons Jewish Delicatessen — $9 for a seven-ounce “L’Original” and $13 for a massive twelve-ounce version. I snagged a “L’Original” on Monday and found the pastrami-and-corned-beef hybrid description to be apt. A warning to those used to the fillers in, say, a typical Reuben: This is a no-nonsense sandwich, with nothing but a smear of mustard to adorn the thick slices of meat, which was well-marbled and quite salty — tasty enough that I had to exercise extreme self-control to save half the sandwich (okay, maybe it was a quarter) for my wife. The sandwich came with a fat, crunchy pickle that had an unexpected, but pleasantly bracing, trace of heat. Lex Gopnik-Lewinski, the man behind the pop-up, later told me that Monday was the very first time he’s dabbled in the restaurant business — the first time he’s served his smoked meat to anyone outside of friends, family, and co-workers. A native of Canada, Gopnik-Lewinski said he first started experimenting with making the product at home two years ago, having grown tired of smuggling big batches through customs every time he came back from visiting family in Montreal. When co-workers started offering to buy the stuff from him, he figured he was onto something. One point of clarification, courtesy of Gopnik-Lewinski: In Quebec, regular folks call this local specialty “smoke meat,” not “smoked meat” — drop the “d” if you don’t want to sound like a tourist. Besides sandwiches, the Augie’s pop-up also sells smoke meat by the pound ($20 for a vacuum-sealed bag) and serves another Montreal classic: poutine — double-fried Kennebec potatoes topped with cheese curds and St. Hubert brown gravy imported straight from Quebec. No worries if you missed Monday’s debut: Augie’s will pop up at Beauty’s every Monday this month, from 11 a.m. to 3 p.m. If the business continues to do well, Gopnik-Lewinski said he might extend the pop-up stint into September. After that, who knows? Gopnik-Lewinski didn’t rule out the possibility of eventually quitting his day job — at Comcast SportsNet — to sling smoke meat full-time. "If people are into it, then I'll keep making it," he said.